WASHINGTON — The head of the 189-nation International Monetary Fund said Tuesday the global economy is at a "delicate moment" with a hoped-for rebound in growth later this year being threatened by a variety of factors such as rising trade tensions between the world's two biggest economies. 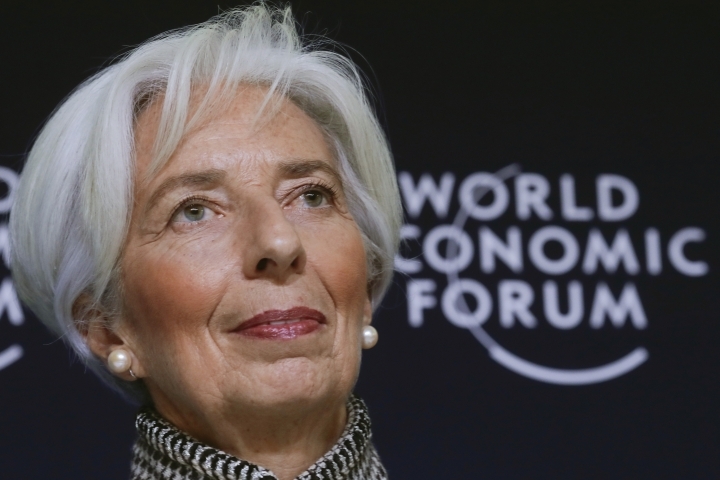 IMF Managing Director Christine Lagarde said the IMF does not forecast a recession in its updated economic outlook to be released next week, but she called the current situation "precarious" and vulnerable to policy mistakes. She said a hoped-for rebound later this year had been helped by the actions of central banks including the announcement of the Federal Reserve earlier this year that because of the economic slowdown, it was putting future interest rate hikes on hold. "To be clear, we do not see a recession in the near term," Lagarde said in a speech to the U.S. Chamber of Commerce. "In fact, we expect some pickup in growth in the second half of 2019 and into 2020." The IMF next Tuesday will release an updated World Economic Outlook. In January, it had trimmed its forecast for global growth to around 3.5% for this year and next year, based on the headwinds caused by rising trade tensions, the uncertainty surrounding Britain's planned exit from the European Union and tighter financial conditions, including the Fed's four rate hikes last year. Lagarde said that all of those factors had resulted in a dramatic reversal in prospects for many countries. Just two years ago, she said, 75% of the global economy was experiencing an upswing in growth. But this year, the IMF is forecasting that about 70% of the global economy will be experiencing a slowdown in growth. Many private economists believe that the United States, the world's largest economy, will see growth slow from an annual gain of 2.9% in 2018 to just above 2% in 2019 as the stimulus from tax cuts and higher government spending begins to fade. Lagarde said new IMF research shows that an increase in tariffs of 25 percentage points on all goods traded between the United States and China would reduce growth in the United States by up to 0.6% and trim growth in China by as much as 1.6%. "Nobody wins a trade war," Lagarde said. "That is why we need to work together to reduce trade barriers and modernize the global trade system so that we all win." Negotiators from the United States and China were scheduled to meet in Washington this week in an effort to resolve differences and avoid further penalty tariffs being imposed by both nations. Lagarde's address was a preview of the issues expected to be addressed during the spring meetings of the IMF and its sister lending organization, the World Bank, taking place in Washington next week.